The West Organ was installed in 1993, and dedicated on Advent Sunday. It is placed on a specially constructed gallery at the West End of the Cathedral. Organ and Gallery together form a striking feature complementing the graceful architecture of the Nave and Chancel. 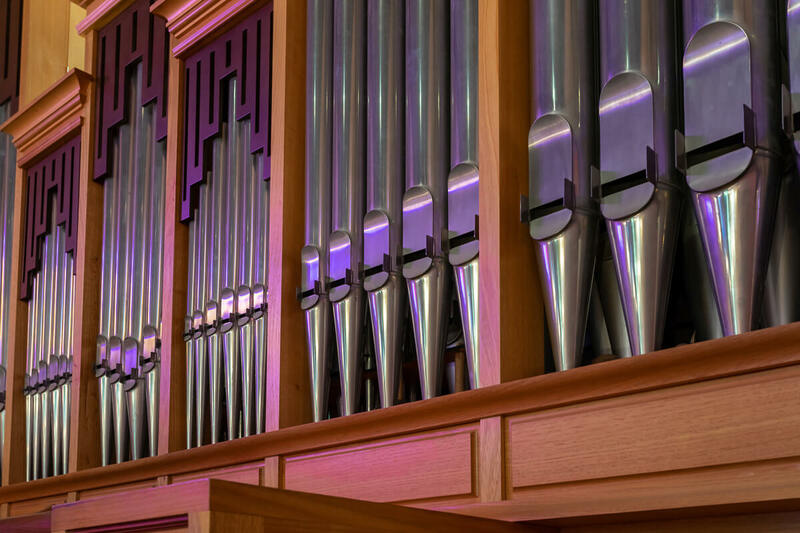 The Organ is the largest mechanical-action instrument to be installed in Western Australia since the similarly sized Ronald Sharp organ in the Perth Concert Hall was completed in 1974. The casework is made of Tasmanian Oak, and the front pipes are of burnished tin. The organ has 4 divisions, 48 speaking stops and 3516 pipes. Tonal revisions and refinements were carried out in 2008/09 by the South Island Organ Company Ltd (SIOC) of Timaru, New Zealand. This included lengthening the resonators of the chorus reeds to provide a more fundamental tone quality, and a thorough cleaning and regulation of the flue pipes to improve the overall quality and cohesion of the sound. In 2010, SIOC installed the 32’ bombarde stop. This enhancement is dedicated to the memory of twelve former Cathedral choristers who died on active service during the Great War. The final pièce de résistance of the West Organ was the addition, also by SIOC, of a solo, horizontal fanfare trumpet, voiced in the French symphonic school. 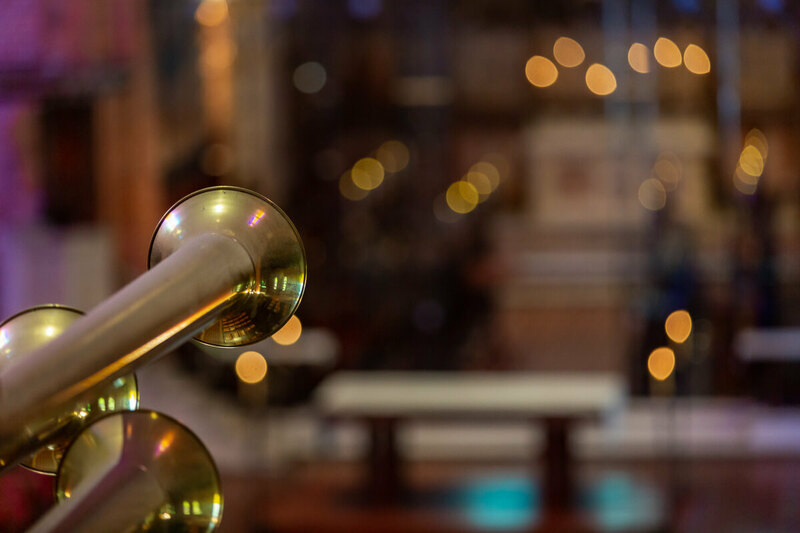 Named in honour of Dr Geoffrey Gates AM, the fanfare trumpet was blessed at Evensong on Sunday May 1, 2011. (c) Action Pure mechanical action, electric stop action. (d) Combinations Solid State of English manufacture giving 8 pistons and cancel on each manual and pedal: also provides 16 general pistons on each of 40 memory levels. In 1994 a new Chancel Organ was installed in the chamber under the Bell Tower. Consisting of 18 stops in 3 divisions, with mechanical key and electric stop action, this small organ is designed to accompany choirs singing in the Chancel. Electric over-ride enables both the Chancel and the West Organs to be played simultaneously from a third, free-standing console. (c) Action Pure mechanical key and electric stop action. (d) Combinations Solid State of English manufacture giving 5 pistons and cancel on each manual and pedal: also provides 16 general pistons on each of 40 memory levels. This instrument was built in 1987, and can be placed anywhere in the Cathedral to serve as a continuo instrument. Its five ranks of pipes are enclosed in a swell box and played from a single manual. The organ has four speaking stops, no pedals and a transposer allowing it to be pitched at either standard pitch of A440 or at A415 for authentic performance of early music. All three organs are by the Australian firm, Knud Smenge Pty, Ltd.
Born at Herning, Denmark on 12 December 1937, Knud Smenge trained in Denmark with the noted firm of Marcussen and then worked as head voicer with Bruno Christensen before his arrival in Melbourne in 1979 to work for Geo.Fincham & Sons Pty Ltd. 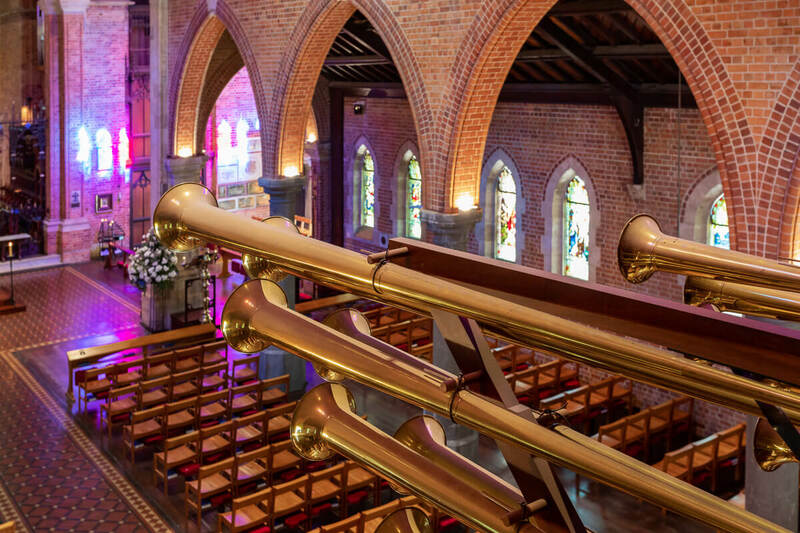 The firm’s work at this time included the highly acclaimed organ at Mary Immaculate Church, Waverley, NSW. In 1981 he started his own firm at West Melbourne and then moved to more spacious premises at North Melbourne before opening his workshop at Healesville in 1991. The firm built its last organ in 1999 and in the period between 1981 and that year constructed 41 new organs for buildings in all Australian states (including cathedral organs in Perth and Brisbane and concert organs in Newcastle and Hobart) and as far afield as Hong Kong and carried out several restorations. A complete worklist of the organs built by Knud Smenge is available here. Smenge passed away at Box Hill, Victoria, on 4 May 2018 at the age of 80. He leaves behind three children in Denmark, six grand children and two great grand children.